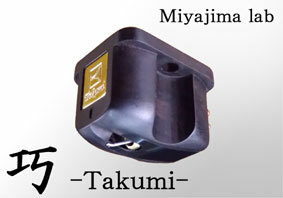 We sell the stereo phono- cartridge of the new method. The cross ring method broke off the fault of the phono- cartridge. 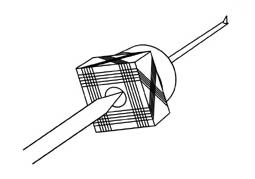 It merges the center point of the coil of right and left by letting the coil of right and left cross. The ability to regenerate of the LP improved drastically by making the center point the fulcrum. 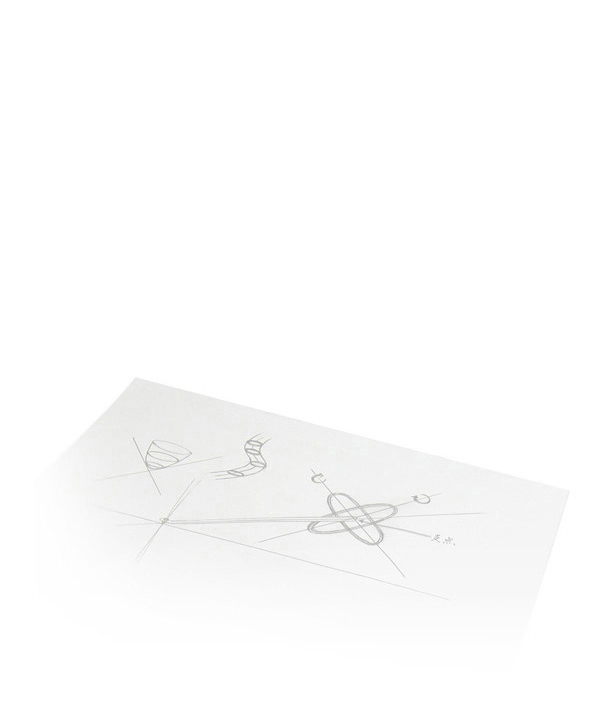 I was able to cancel the most of the cause of the conventional big distortion..
And a cross ring method was devised. I made the main body with wood to maintain a splendid sound. The idea gets a better result. I explain both structure by Flash Movie. Production of Waza has ended. The big characteristic of this cartridge used spine of the Japanese cactus to a cantilever. Like Madake cantilever, I think that the natural subject matter that is not metal makes a natural sound. I spend time for making the materials of the bamboo firmly thin very much. Spine of the cactus is sorted and is only cut. And Spine is attached to an exact base. 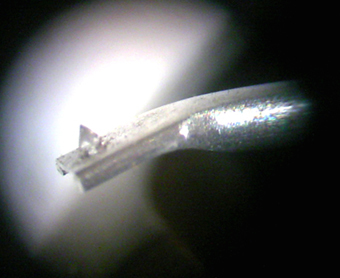 The stylus used the joining diamond needle of a thin aluminum cantilever of 0.5 millimeters in diameter. Saboten slightly has a lingering sound. 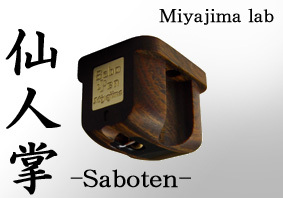 Saboten lets you feel the sound that even a small audio system is rich in. Saboten is superior in the reproduction of a feeble sound. 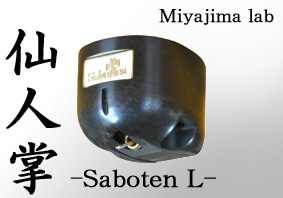 Saboten is the cartridge which it is easy to use in a product of Miyajima-lab most. The main body is lignum vitae said to be the world's hardest tree. Normal Takumi is inexpensive and easy to use. "Takumi L" upgraded Takumi by Line cotact. 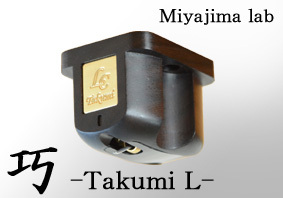 Takumi L has a wider frequency range than Takumi. It is the best model of the cross ring method. 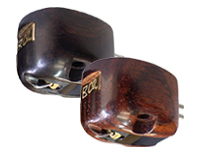 The African blackwood of the main body is used for the materials of a clarinet and the oboe. It has beautiful luster with a heavy tree very firmly. 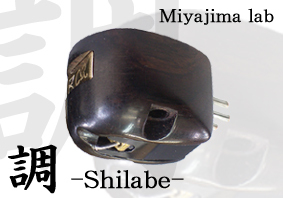 I repeated an experiment to produce the cartridge which is better than Shilabe. I changed some parts and a manufacturing process. 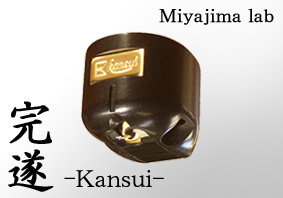 And, I completed cartridge "Kansui". Kansui did not exceed all of Shilabe, but I felt splendor of Kansui while I listened to many records. When you listen to a magnificent orchestra, I think that you understand it. Saboten L selected carefully from a bit big beautiful cactus spine. The tip of the cactus cantilever ties a short aluminum cantilever of 0.6 millimeters in diameter and attaches the pure diamond needle of the line contact. It is a clear sound and expresses a delicate sound. It does not give a useless sound. It is hard to handle Saboten L for low compliance very much. I thought about a plan change first, but decided to just make it. I thought it to be the nearest from an original sound. I feel the good tone of the musical instrument and feel clear distance between a sound and sounds. A start and force and the low tone speed are the best. It is hard to handle this cartridge most in Miyajima-lab, but I want to certainly recommend it to a user possessing a large audio system. You can enjoy real music by Saboten L.
The Cameroonian ebony body is hard and is heavy. A black body has some white spots. It is hard to look with a photograph, but is a beautiful spot. 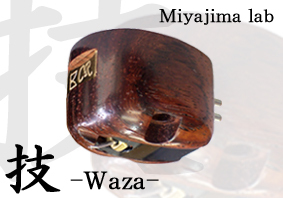 We used Japanese bamboo (madake) for a new cartridge. Mr.Thomas Edison used this special madake to the filament of the electric bulb in old days. 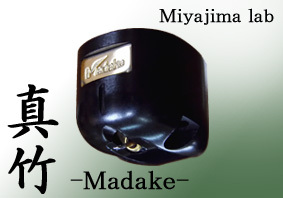 This special madake is produced only from the mountain of Kyoto, Japan. 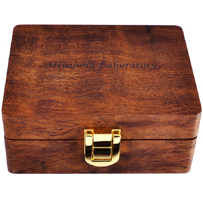 Mr.Thomas Edison found this highest quality madake from 1,200 kinds of bamboo of the world. This madake is the firm bamboo which grew in the rich soil of the iron content. Because I was looking for the firm cantilever which was not metal, it was the accidentally same condition. I negotiated to obtain special madake in Iwashimizu Hachiman-gu Shrine of the mountain of Kyoto. Because I respect Mr.edison of the inventor, "Edison" is included in the name of my Japanese audio shop. Therefore, they handed over some madake to us in an exception. Madake of ideal materials has special sound quality. Madake is rare bamboo now. They do not sell bamboo (madake). Please do not do an inquiry of the madake purchase to Iwashimizu Hachiman-gu. 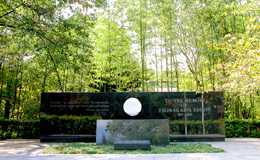 There is Edison monument in Iwashimizu Hachiman-gu Shrine. 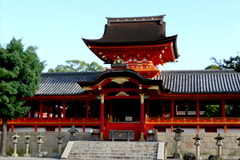 Iwashimizu Hachiman-gu Shrine is one of Japan's three biggest Hachiman-gu Shrine. Among many experiments, I learned that there is an important relationship between the needle pressure of the cartridge and the weight of the main body. However, it was not a good thing if it was heavy, but we needed ingenuity of material and structure. The completed sound is a balance like an isosceles triangle. The bass is thick and tight. A treble that has no useless resonance is realistic. Sound separation is the best ever. It is feeling that all the performers are putting their feet on the ground. The sound image is stable, there is spreading and depth and presence. When you finish listening to the LP, you will feel like clapping players unintentionally. 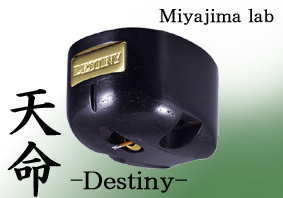 Destiny of the stereo cartridge used bamboo cantilever and LC solid diamond stylus. It is light and strong by careful processing. Until now, we have weighted the head shell and adjusted the weight with a spacer. 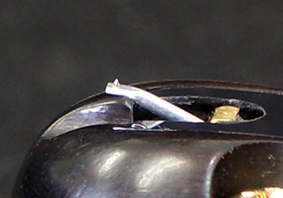 However, it seems to be a little different from when we heavy the cartridge body. I would like to listen to drums and bass' s Arco style all the time. There is little sense of distortion, and it reproduces to very small sounds. By making the body heavy, the extra sound generated by the intense movement of the needle point is gone. 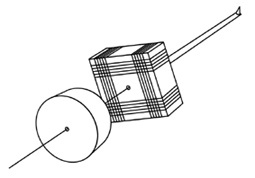 Since the self weight of the cartridge became heavier, it is necessary to select the arm, but it was able to demonstrate the merit of the cross ring method to the maximum. 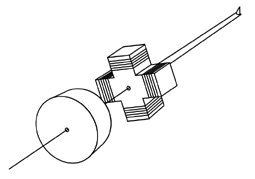 The cross ring method is aimed at reproducing the sound of the LP precisely. I think that music is recorded by a good sound to an LP. The reproduction that is good if there is doubt on the part of a cartridge picking up a sound is impossible. I use the cantilever which is bigger than a thing used generally for the cartridge of the product. The reason is from the that a cantilever bends at the time of reproduction when I use a thin cantilever. I repeated an experiment for correct reproduction. And I use the cantilever of a good result. If you like true sounds, the cross ring method will become the best product. 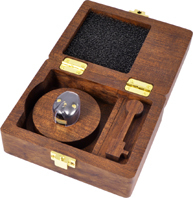 Generally a terminal of the brass is used, but uses the thing which processed copper wire. 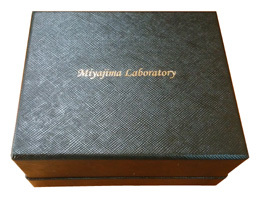 A case and a certificate are enclosed to a product.